TWO sleek towers are proposed on each side of Vine St. The business community hails the economic activity the Millennium Hollywood mixed-use project will generate. Neighborhood groups oppose the development, and city officials have voiced concerns of the sheer size: two towers, each reaching more than 50 stories. “I hope they could be lowered… greatly,” Councilman Tom LaBonge said in a phone interview last month. “I do believe anything over 29 stories would overwhelm what we know and love of Hollywood.” The tallest building in the area is 22 stories. New York-developer Millennium Partners’ Millennium is more than double that amount. Two sleek towers are proposed on each side of Vine St., with the Capitol Records Tower as a centerpiece on nearly five acres of what today is parking lots. The project includes more than one million square feet with 492 units, 200 hotel rooms and office, restaurant and retail space. “We are very excited about what the future holds for Hollywood, and have made a substantial investment to make that vision a reality,” Philip E. Aarons, founding partner of Millennium Partners said in a press release. Both Hollywood and Los Angeles Chambers of Commerce support the development they say will create jobs and bring business to the area. The city Planning Commission unanimously approved the project, set near the Metro Red Line and transit corridor. But the opposition is fierce and includes StopthemilleniumHollywood.org, headed by the Beachwood Canyon Neighborhood Association. “We are fighting back. We have hired an attorney and a traffic consultant to represent the ‘community,’” the group’s website states. 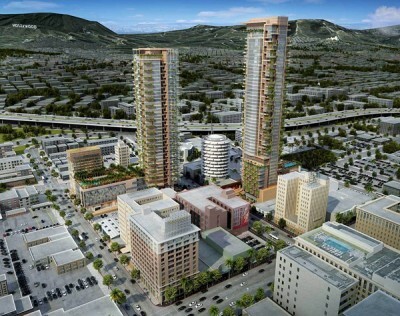 Hancock Park Homeowners Association and the Greater Wilshire Neighborhood Council are among several neighborhoods groups that also oppose the scope of the development. The city Planning and Land Use Management Committee will consider the appeal Tues., June 4 at 2:30 p.m. at City Hall, 200 N. Spring St.